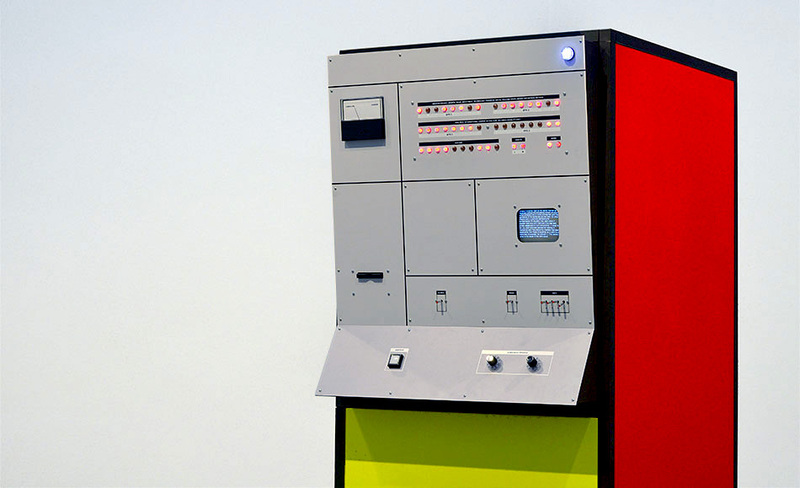 The installation "S360" looks like the historical IBM System/360 computer system. In 1964 this system was IBMs leap to turn computer architecture into a commercial product. The material design of the System/360 was a modernist statement: Cubes, sharp angles, clean surfaces and strict organization of element. The System/360 was bold in its visual expression: A black frame with colorful sides and a light grey/white front panel. The casing was produced in different colors: Yellow, blue and red. These bold colors and the strict black rectangular frame gave the System/360 a “Mondrian” look. The form materialized a modernist view of the world empowering by technology . The installation “S360” is using an algorithm to write a never-ending text. Seminal texts forms the sources of inputs to the system, and by using a textual reconstructive textual synthesis based on trigram analysis, the installation will try to write a new text based on “The Capital” by Karl Marx and “The Wealth of Nations” by Adam Smith. The operator’s panel of “S360” is filled with switched, flashing lights, meters and knob - as it was on the original IBM System. Visitors can control the device using this panel. Interaction will influence the text being generated. How the resulting texts are being utilized is also determined by visitor input. Two choices are possible: Tweet or print. If the switch “Global” is chosen on the front panel, a shortened version of the text will be immediately submitted to the Twitter-account of the installation. If “Manifest” is chosen, the current section will printed on a receipt-printer for the visitor to take home. All generated texts are stored in their full length. “S360” was commissioned by Kunsthal Aarhus for the exhibition "Systemics #3. Against the idea of growth, towards poetry (or, how to build a universe that doesn’t fall apart two days later)". Danish Arts Council Committee for Visual Arts.